Encephalartos concinnus R.A.Dyer & I.Verd. Origin and Habitat: Encephalartos concinnus is found in three localities in southern Zimbabwe in the provinces of Matabeleland South, Midlands and Masvingo. They are referred to as the Gwanda, the Mberengwa and the Runde subpopulations. Unconfirmed reports indicate that the Runde subpopulation no longer exists. There may be other colonies close by those visited. Surveys of the known populations indicate that there are ca. 50 mature plants in the location at Gwanda (West Nicolson) and at least 160 mature plants at Mberengwa (only plants in accessible areas were counted). Altitude range: 800-900 metres above sea level. Habitat and Ecology: Scattered and sporadic, E. concinnus occurs on hot, dry steep-sided rocky valleys with few sparse trees. They are also found in very exposed harsh conditions amongst granite boulders or on steep cliffs, where they grow among grass or under small trees. The habitat is subject to frequent night and morning mists. These plants do not tolerate frost. E. concinnus occurs in Bushveld and Miombo woodlands. This species has been adversely affected due to over-collecting for ornamental purposes. In addition, the leaves of this species have been used by local people to make sleeping mats. This has caused the death of some old established plants. Description: Encephalartos concinnus is an attractive evergreen arborescent cycad that forms large clumps consisting of 3-7 stems up to 3-4 m long and usually lying along the ground. Both the male and female cones are green and the seed-coats are red. Its straight leaves are dark green in colour with short petioles and numerous reduced spine-like leaflets, median leaflets with 1-3 spines on each margin. 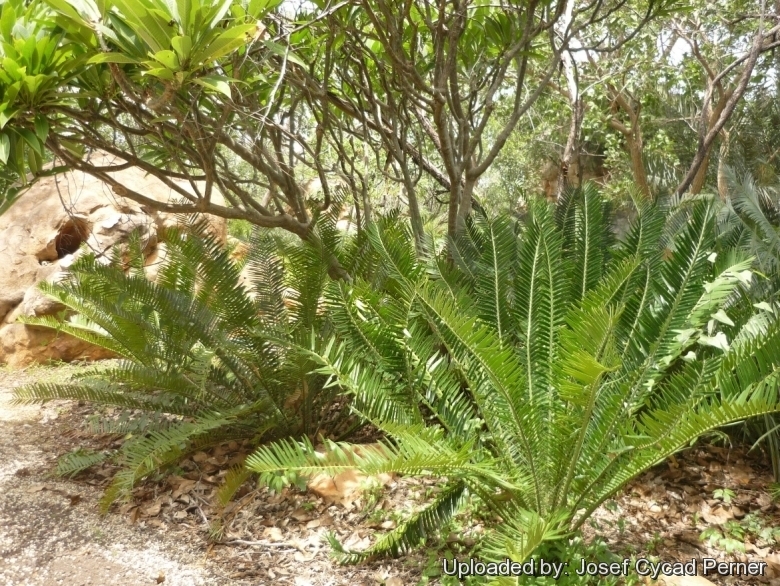 There was some variation in the length and shape of the leaflets in the 2 existing colonies, suggesting that 2 slightly different forms of this cycad exist. Derivation of specific name: Latin concinnus, 'well adjusted' or 'elegant', referring to the neat, compact and elegant appearance of the male cones scales. Stems (trunks): Up to3(-4) m tall, and 45 cm diameter, often producing multiple trunks and multiple branches. Leaves (fronds): The leaves are 1.5-2 m in length, light or dark green, semiglossy, with a distinct blue accent for those plants growing in the shade, flat (not keeled) in section (opposing leaflets inserted at 180° on rachis); straight, stiff, not spirally twisted; petiole straight, with 1-6 prickles; leaf-base collar not present; basal leaflets reducing to spines. Leaflets lanceolate, weakly discolorous, not overlapping, not lobed, insertion angle obtuse (45-80°); margins flat; upper margin lightly toothed (1-3 teeth); lower margin lightly toothed (1-3 teeth); median leaflets 10-15 cm long, 20-25 mm wide. Pollen cones: 1-4, fusiform, green, 30-50 cm long, 7-10 cm in diameter. Seed cones: 1-2, ovoid, green, 35-45 cm long, 15-20 cm in diameter. Seeds: Oblong, 30-35 mm long, 18-23 mm wide, sarcotesta red. Taxonomy notes. Described in 1969 by South African botanists R. Allen Dyer and Inez Verdoon, who separated the previously broadly defined Encephalartos manikensis into a number of segregates, primarily on differences in pollen cone morphology. 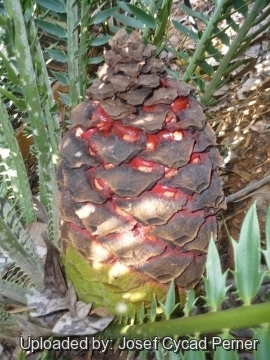 E. concinnus has a smaller cone than Encephalartos manikensis. 1) Donaldson, J.S. 2010. Encephalartos concinnus. The IUCN Red List of Threatened Species. Version 2015.2. <www.iucnredlist.org>. Downloaded on 25 August 2015. 4) Haynes J.L, “World List of Cycads: A Historical Review”, IUCN/SSC Cycad Specialist Group, 2011. 5) The Cycad Pages “Encephalartos concinnus” Royal Botanic Gardens Sydney Written and maintained by Ken Hill 1998-2010 Maintained by Leonie Stanberg and Dennis Stevenson 2010-2012 <http://plantnet.rbgsyd.nsw.gov.au/cgi-bin/cycadpg?taxname=Encephalartos+concinnus> Web. 24 August 2015. 6) Hyde, M.A., Wursten, B.T., Ballings, P. & Coates Palgrave, M. (2015). "Flora of Zimbabwe: Species information: Encephalartos concinnus." 7) Coates Palgrave K. (revised and updated by Meg Coates Palgrave) “Trees of Southern Africa” 3rd edition. Struik, South Africa Page 84. 2002. 8) Dyer, R.A. & Verdoorn, I.C. “Encephalartos manikensis and its near allies” Kirkia 7(1) Pages 152 - 154. (Includes a picture).1969. 9) Mapaura, A. “Endemic Plant Species of Zimbabwe”. Kirkia 18(1) Page 125. 2002. Cultivation and Propagation: As a garden subject, Encephalartos concinnus is medium-to-large-sized cycad that despite the harsh environment it in which it lives does seem to like regular water and a little fertiliser. 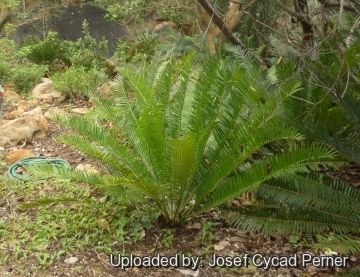 This cycad is easy to grow but hard-to-find, as it does not occur in large numbers in any of its localities, but rather in small, isolated colonies. Historically, the lack of access to this plant and its seeds have made it a very rare plant in cultivation. It tends to sucker well and is very adaptable in cultivation. provided it has a well-drained soil, frost-free conditions and regular watering during the dry months. It is an adaptable plant well suited to subtropical climates. It can be grown in full sun without its leaves burning. When young they can be grown as a container plant and eventually transplanted into the garden. It deserves to be grown more widely. Uncommon in cultivation. Growing rate: In its first 5 years, seedlings are not as vigorous as Encephalartos manikensis, Encephalartos munchii or Encephalartos pterogonus, however once the seedling caudex reaches 20-30 mm they grow more vigorously. Seedlings planted out in raised beds and carefully mulched - so the soil could never dry out - grow much faster than the seedlings kept in pots. With its short uniform leaflets and attractive green foliage, this cycad makes an impressive display once it has been planted in the around for 3 or 4 years. Hardiness: Frost sensitive (USDA zones 10-12). Encephalartos manikensis is well represented in botanical gardens and private collections worldwide where the tropical cycads can be grown. However it exhibits an unusual amount of cold tolerance by surviving in temperate areas as well. In the warmer portions of southern California it grows with apparent ease, only suffering defoliation or leaf burn during extreme winters.